Definition: Riboswitches are structured noncoding RNA domains that selectively bind metabolites and control gene expression (Roth and Breaker, 2009). The term riboswitch was used to define RNAs that control gene expression by binding metabolites without the need for protein factors or a protein-independent gene regulation mechanism. Transcription termination in bacteria is a classical example of riboswitch in action. 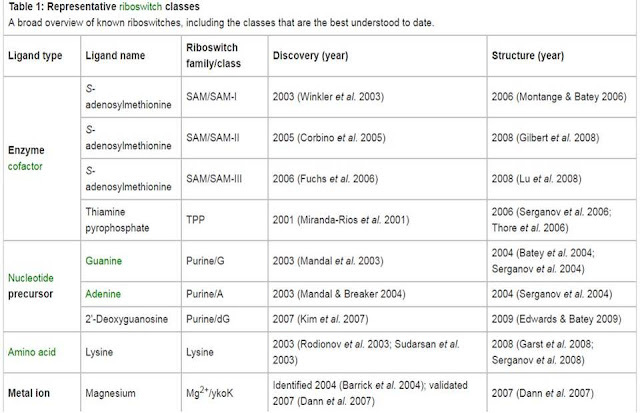 The most widespread riboswitch class discovered to date responds to the coenzyme thiamin pyrophosphate (TPP). This riboswitch is quite common in plants and fungi. · Riboswitches are most often located in the 5' untranslated region (5' UTR; a stretch of RNA that precedes the translation start site) of bacterial mRNA. · Riboswitches are composed of two domains: the aptamer domain (ligand binding domain) and the expression platform. The aptamer domain acts as a receptor that specifically binds a ligand. · The expression platform regulates gene expression through its ability to toggle between two different secondary structures in response to ligand binding (Figure 1, blue). 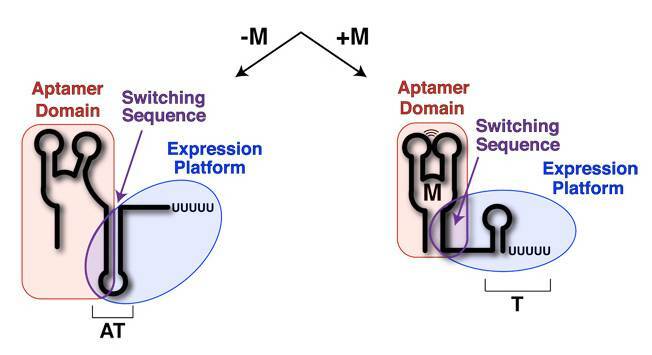 · Common to both domains is something called the switching sequence, (that can pair with both aptamer domain or the expression platform) and its placement or pairing in the aptamer domain or the expression platform ultimately dictates the expression outcome of the mRNA. 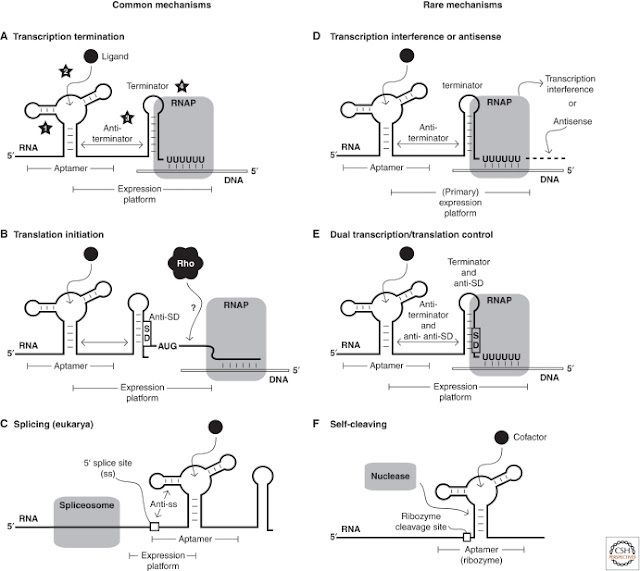 Established or predicted mechanisms of riboswitch-mediated gene regulation. The most common mechanisms are (A) transcription termination, (B) translation initiation, and (C) splicing control (in eukaryotes). More rare mechanisms observed or predicted in some bacterial species include (D) transcription interference or possibly antisense action, (E) dual transcription and translation control, and (F) ligand-dependent self-cleaving ribozyme action. The numbers in a identify steps that are important for kinetically driven riboswitches (Wickiser et al. 2005a,b; Gilbert et al. 2006). Numbers represent (1) folding of the aptamer, (2) docking of the ligand, (3) folding of the expression platform, and (4) speed of RNA polymerase (RNAP). In B, Rho represents the transcriptional terminator protein (Skordalakes and Berger 2003). · Riboswitches that control transcriptional repression have a switching sequence that directs formation of a Rho-independent transcriptional terminator, a short stem-loop structure (followed by six or more uridine residues) that signals RNA polymerase to stop transcription. · Riboswitches that regulate translational initiation utilize a switching sequence that can expose ribosome-binding site (called theShine-Dalgarno sequence) in bacteria. Riboswitches are organized into families and classes based on two features: the type of ligand they bind, and their secondary structure. A family of riboswitches is typically a group of RNAs that recognizes a specific ligand. Example, the SAM riboswitch family recognizes the compound S-adenosylmethionine (SAM). The family is further divided into distinct classes of riboswitches, based on the common sequence pattern that usually defines the ligand-binding pocket, as well as features required for folding the RNA into a three-dimensional shape. The SAM riboswitch family contains at least five known classes. These classes are distinguished from one another by their specific secondary structure or domain features. For example, the SAM-I class forms a four-way helical junction, SAM-II forms a classic (H-type) pseudoknot, and SAM-III is defined by a three-way junction. The structural and functional diversity of metabolite-binding riboswitches.Roth A, Breaker RR. Annu Rev Biochem. 2009; 78():305-34. Breaker, R. R. (2012). Riboswitches and the RNA World. Cold Spring Harbor Perspectives in Biology, 4(2), a003566. Garst, A. D., Edwards, A. L., & Batey, R. T. (2011). Riboswitches: Structures and mechanisms. Cold Spring Harbor Perspectives in Biology, 3(6), a003533.